Friday, July 17 1908 -- A visually striking Herriman cartoon with a sentiment that applies just as well today as a hundred years ago. 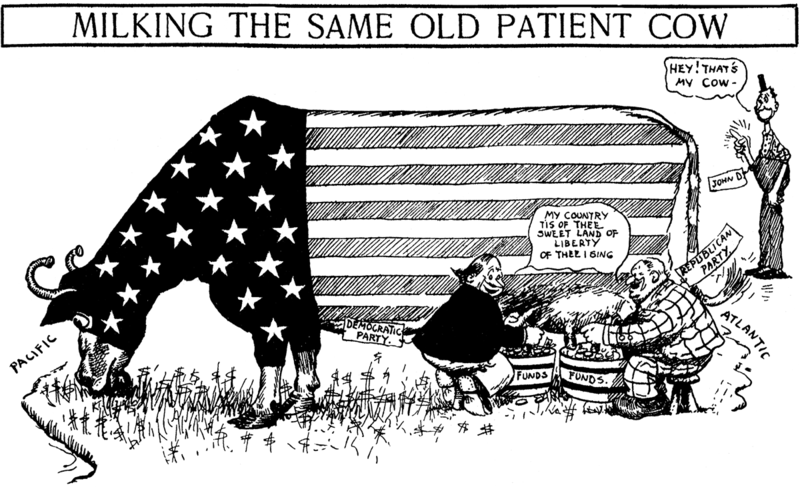 The United States is just a big cow being milked by big business and politicians. Connie, January 10 1937, courtesy of Cole Johnson. It's nice to see that all those Mary Kay Cosmetics Sales Points were still valid in the 30th Century. My neighbor-whom I avoid like a Venusian plague-- is about 357 make-overs short of a Pink Hover-craft. Augustus Joseph Robinson was born in Boston, Massachusetts on September 28, 1886, according to the City of Boston Birth Records at Ancestry.com. His parents were Frederick and Sarah. In the 1900 U.S. Federal Census, Robinson was the second of three children. Their father was a messenger. The family lived in Boston at 184 Webster Street. Robinson was a clerk, at 180 Devonshire, according to the 1906 Boston city directory. He resided at his parents’ home. In 1910, Robinson was at the same address but employed as a “checker” at a “freight shed”. His employment as a stereotyper, in the printing trade, was listed in the 1913 through 1916 city directories. His address was 641 South Street, his parents’ home. On June 5, 1917, Robinson signed his World War I draft card which had his birth year as 1888. His address was unchanged but his occupation was commercial artist at the Denninson Manufacturing Company. His description was five feet six inches, slender build with blue eyes and light brown hair. According to the Boston Traveler, October 12, 1963, he was a navy veteran and “official illustrator for the First Naval District”. Information regarding his art training has not been found. The 1920 census recorded Robinson as part of his parents’ household. He was a designer in the engraving industry. The city directory, of the same year, listed him twice: “Augustus A”, commercial designing; and “Augustus J”, artist. 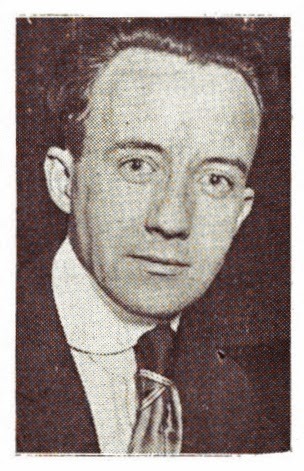 The 1922 and 1925 directories had two listings for him: “Augustus J (Bob Robinson)” and “Bob (Augustus J Robinson) commercial artist”, both working at 170 Summer, room 327. Robinson (Augustus Joseph) Roslindale, Mass. 10626-1963[?] (Famous American ships) :Fore-word, etc.—Mary Celeste (Brigantine)—Olympia (Cruiser) Sovereign of the Seas (Ship)—Trenton (U.S.S.) © Oct. 16, 1931; 2 c each Dec. 28; K 15364–15368. Robinson’s navy background and experience proved useful in his Sunday page, Decks Awash, which began November 16, 1935. 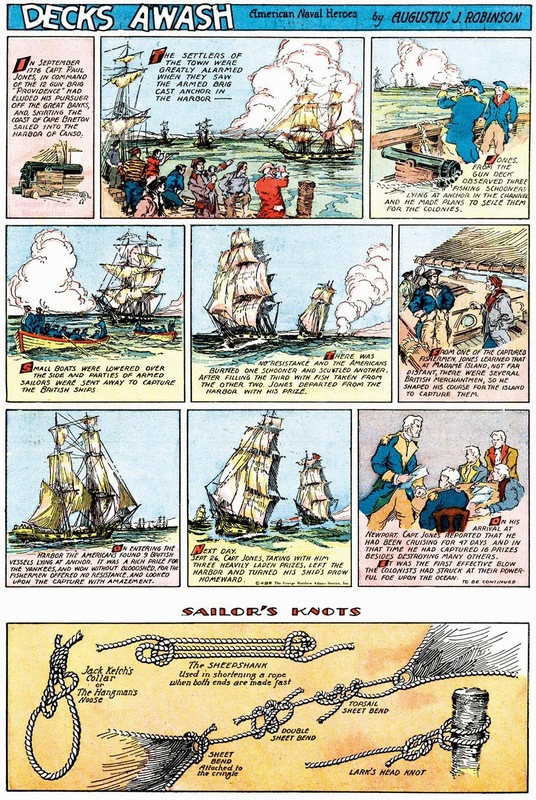 A few of those strips, and the topper, Sailor’s Knots, were reprinted in the comic book, The Comics, in 1938. At some point, Robinson married Mary Sullivan. They were listed in the 1939 city directory at 273 Chestnut Avenue. He was a junior draftsman at the “US Govt Eng’s office”. The couple’s address was the same in the 1940 census. Robinson was a map draftsman in geodetic survey. His World War II draft recorded his home address as 641 South Street. He was employed at Massachusetts Geodetic Survey in Cambridge. He continued work as a draftsman. A 1945 city directory said he lived at 9 Rawston Road. Robinson had an exhibit at Paine Furniture Company, which ran an advertisement in the Boston Traveler, October 25, 1945. He copyrighted a color print in 1948. Around 1946, Robinson moved to New Hampshire. The 1952 and 1960 Exeter city directories listed his address as Robin Road and occupation as artist. Robinson passed away October 11, 1963, in Portsmouth, New Hampshire. His death was reported the following day in the Boston Traveler. Rye, N.H.—Augustus J. Robinson, 70, of 12 Robin Rd., a marine artist, died Friday at Portsmouth Hospital. Born in Boston, he moved here from the Roslindale section of the city 17 years ago. He was formerly artist on the now defunct Boston Post. A World War I Navy veteran, he was the official illustrator for the First Naval District. He was a member of the Roslindale Post, A.L. [American Legion], the Arthur T. Patch Barracks, World War I Veterans; the Portsmouth Art Association and the St. James Holy Name Society in Portsmouth. He leaves his wife, Mary (Sullivan); a brother, Frederick A., Jr., of West Roxbury, Mass., and a sister, Mrs. Sarah L. Bertsch of South Natick, Mass. A solemn high requiem Mass will be sung at 9 a.m. Monday in St. James Church, Portsmouth. Burial will be in Holyhood Cemetery, Brookline, Mass. When the George Matthew Adams Service decided to get into the business of producing Sunday comics, they made a pretty ridiculous marketing blunder. Instead of competing head-to-head with other syndicate offerings for space in the regular Sunday funny pages, they chose to create their own complete 8-page tabloid Sunday comics section. The reasoning for going that route is simple. There are lots of newspapers all around the country that don't have the resources to print their own comics, or to pay one of the big national printers to do it for them. GMA reasoned that if they could get their sections printed on the cheap -- not a problem if you were printing up a huge number for a whole bunch of client papers -- that they could offer these smaller papers an attractively inexpensive Sunday comics section. The only problem with the idea -- which sounds pretty good on the surface -- is that it had been tried plenty of times by others. The last time the idea had worked well was back in the '00s! Since then the economics of the newspaper industry had changed such that a preprint Sunday comics section scheme just didn't make sense. The papers who were so small as to not be able to pay for a full-fledged comic section, were run on such a threadbare shoestring that they couldn't afford even the low-cost preprint section. Just as others before and after them, George Matthew Adams got plenty of initial interest from small papers, but when it came time to actually cough up some dough, empty pocket syndrome set in. Anyway, that's a lot of explanation to lead us to today's obscurity, which was one of the features of that ill-fated preprint section. The George Matthew Adams Sunday section lasted less than a year, and appeared in a small number of country papers. Decks Awash was actually a replacement in the section, taking over the spot previously occupied by an airborne adventure strip titled Cap'n Cloud. The fault, as I said, was mostly to do with the economics of the section, not so much the content, some of which was pretty appealing. 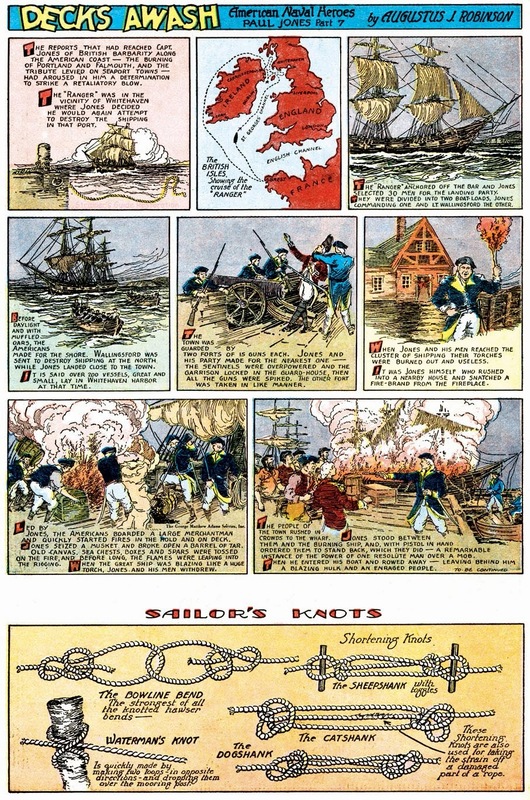 That includes Decks Awash, which despite the terrible handicap of being an educational history strip, was far from the worst I've encountered from that genre. Sure, the strip was a bit wordy, but the stories were fast-paced. They also depicted scenes of battle, a sure way to get junior to at least peruse the strip, even if he assiduously refrained from reading any of the captions. The kids might even find time on a lazy Sunday afternoon for trying out some of the fancy Sailor's Knots depicted in the strip's topper panel. 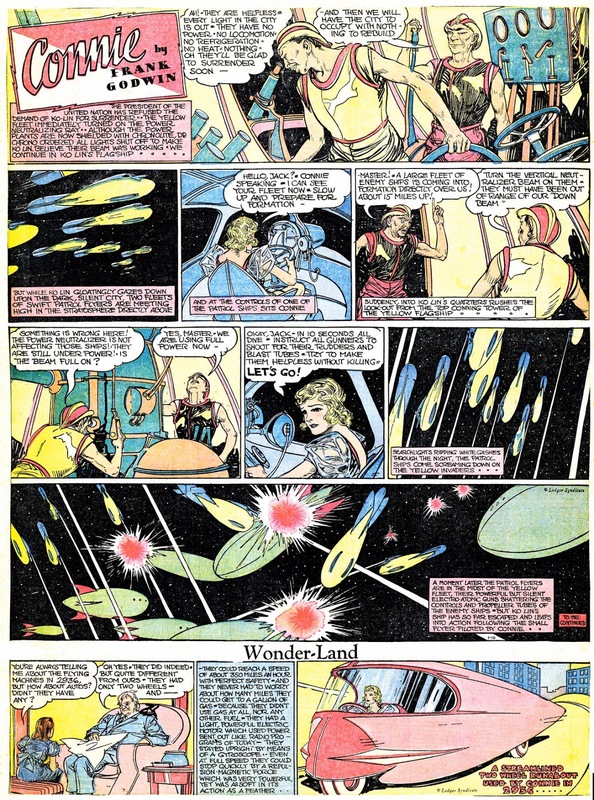 The author/artist was a fellow by the name of Augustus J. Robinson, who has no other comic strip credits that I know of. He did achieve some small measure of fame for his historical nautical paintings later on. Decks Awash appeared in the section from November 16 1935 until the presumed end of the section's life (meaning I have yet to find any later samples) on April 4 1936. 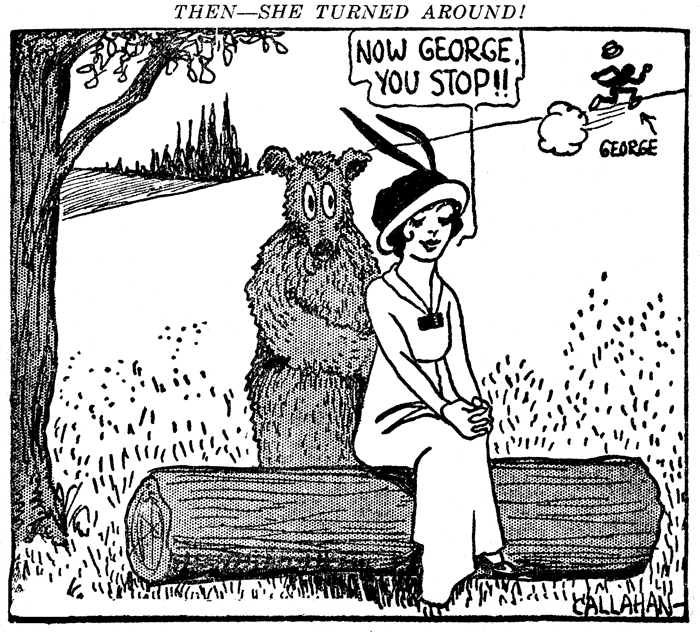 The topper changed to Sailor's Ways starting March 7, as I presume the author ran out of knots to depict. The drawing of the first diagram was assigned to Jack Callahan, then a cub artist, now known as the creator of the famous come strip, “Home, Sweet Home,” and was printed merely as miscellany—a curiosity to help the page. Callahan’s diagram drawing can be viewed here. The 1915 New York State Census recorded Callahan and his parents in Brooklyn at 220 East 9th Street. His father was a manager in a carpet department. Callahan was a newspaper artist. 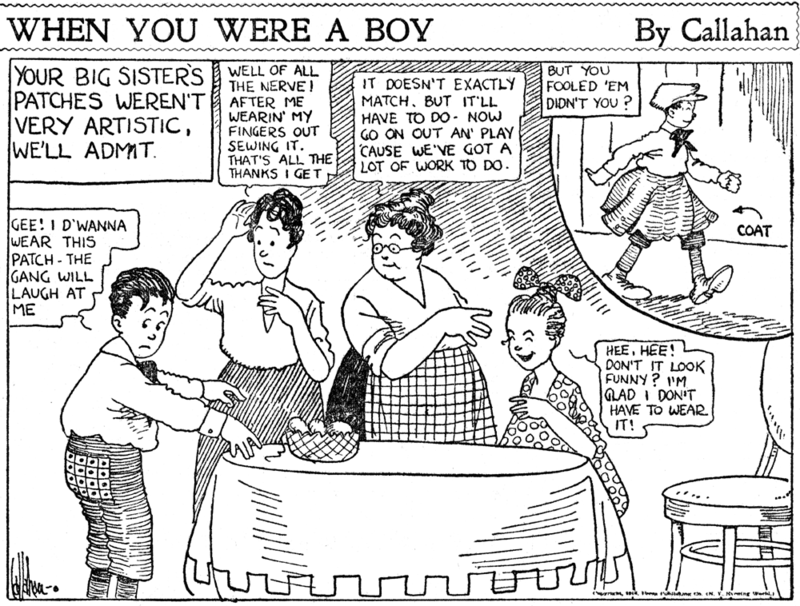 According to American Newspaper Comics (2012), some of Callahan’s strips and panels in the 1910s include: A Yarn of Nancy B. (1912–1913), Life’s Little Ifs (1915 –1917), When You Were a Boy (1916–1917), Big Moments in Little Lives (1916), Bonehead Bill (1916), Flivvers (1916–1917), Over Here (1917–1919) which was retitled, Hon and Dearie (1919–1921), and Cinderella Suze (1918). Callahan signed his World War I draft card on June 5, 1917. 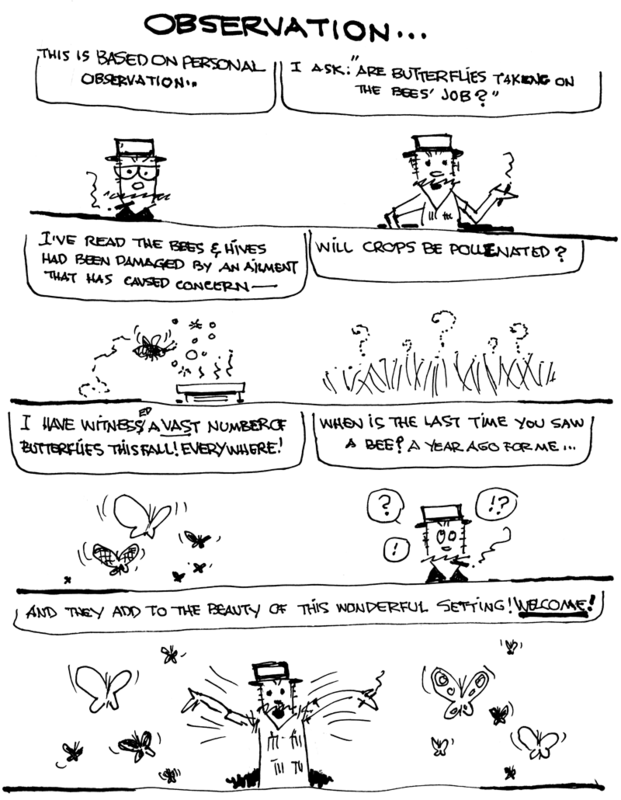 His occupation was freelance comic artist. He was described as five feet four inches, slender, blue eyes and brown hair. In the 1920 census, Callahan lived with his parents, James and Millie, in Brooklyn at 299 State Street. His occupation was newspaper artist. 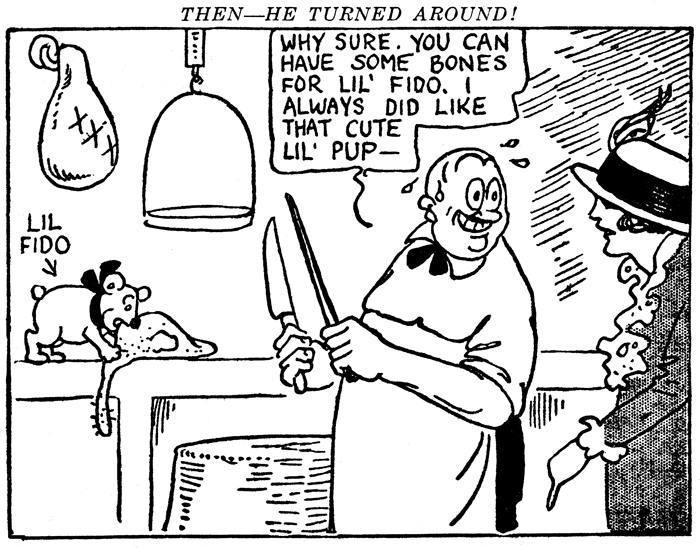 Some of his strips, in this decade, include The Piffle Family (1922), Freddie the Sheik (1924-1929), Dizzie’s Eating House (1926–1931) and Clarabelle's Cousin (1928-1931). On January 2, 1926 the New York Times reported Callahan’s marriage. Jack Callahan, comic artist of the New York American, and Helen Carr, who used to dive from the roof of the Hippodrome in the spectacle “Happy Days,” were married Wednesday afternoon at Borough Hall, Brooklyn. They had known each other since childhood…. …He told only a few intimate friends of his wedding until yesterday, when the news was made more generally known through announcement cards of his own design bearing the inscription, “Ringing in the New Year,” and showing the bride and bridegroom standing together inside a gigantic wedding ring. The couple are living at present at the Hotel Pennsylvania, where Mr. Callahan has resided for several years. Carr’s dive from the roof of the Hippodrome caused her loss of sight. In the 1930 census the Callahans lived in North Hempstead, New York, at the Belgrave Square Apartments on Brompton Road. His occupation was an artist working in publishing which included the strip, Home, Sweet Home (1935-1941). Callahan has not been found in the 1940 census. He signed his World War II draft card on April 26, 1942. In Brooklyn his home address was 1775 75th Street. He was a self-employed artist who worked at 1771 75th Street, which was the same address for his wife. It’s possible that 1775 was written in error. During the second half of the 40s, he found work in the comic book industry; some of his credits are here. Callahan passed away August 24, 1954. His death was reported two days later in the Times. Jack Callahan, newspaper comics strip artist, whose work appeared in The New York American for many years until 1940, died Tuesday afternoon of a heart attack while playing tennis near his home, 1771 Seventy-fifth Street, Brooklyn. His age was 65. Mr. Callahan was best known for his comic strips, “Hon and Dearie,” “Freddie the Sheik,” and “Calamity Jane.” In 1926, he married Helen Carr, the girl who did the sensational dive from the roof of the New York Hippodrome in “Happy Days” and “Cheer Up.” She is the only immediate survivor. According to U.S. Veterans Gravesites, ca.1775-2006, at Ancestry.com, he was buried at the Long Island National Cemetery in Farmingdale, New York. Regular readers know that I'm a sucker for this sort of feature, where the punchline depends on your imagination to conjure up what comes next. Then He (or She) Turned Around was one of Jack Callahan's stable of features when he was working in the New York Evening World bullpen 1913-17. This was one of his earlier efforts, and was done in tandem with another very similar feature, But He Changed His Mind. 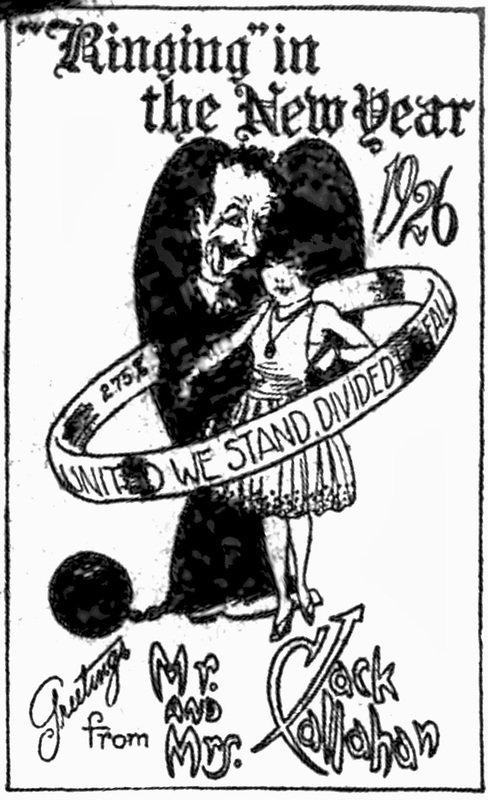 This one first appeared on January 24 1914, and last ran on July 28 of that year. Callahan's art style may appear rather simple and even pedestrian to us a hundred years later, but his very clean lines and uncluttered panels were a bit of a novelty in their day, and helped him to stand out from the other cartoonists. 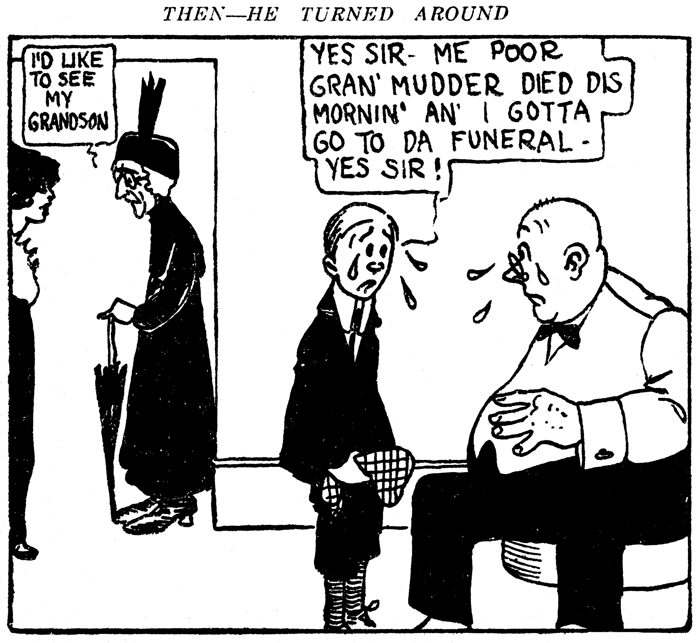 I also noticed that he used a Benday screen in two of these panels, rather than the crosshatching preferred by most cartoonists prior to the 1920s. I know Benday screens are quite a bit older than this (invented in 1879 according to a short Wikipedia entry on the subject) but I think he qualifies as an early adopter of these screens when it comes to daily comics. Anyone care to set me right on that account, which I'm basically tossing out there to see if it sticks?